Some years I love fall mums and some years not so much. This is one of those years that I am wild about them and can’t get enough! I want them to decorate the outside of StoneGable and the inside too! Mums are the quintessential fall flower! They love growing in this area and almost grow like weeds! 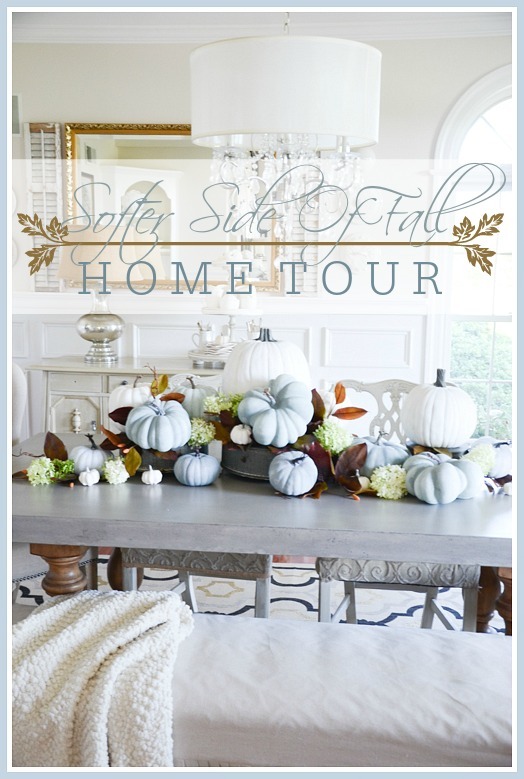 Today I’m going to share a few tips about decorating with mums ! I have a few smart tips to help you style mums beautifully! Most mums come in some kind of plastic nursery container… and they are U-G-L-Y! Keep them in their original container but make sure to slip that container into something pretty or fun or classic or whatever! This is the first and most important step in styling a mum! If you can replant them in a pot or urn or whatever even better, but now always necessary! How often do you use your champagne bucket? You know the one you got for a wedding gift? I love to use it as a planter! 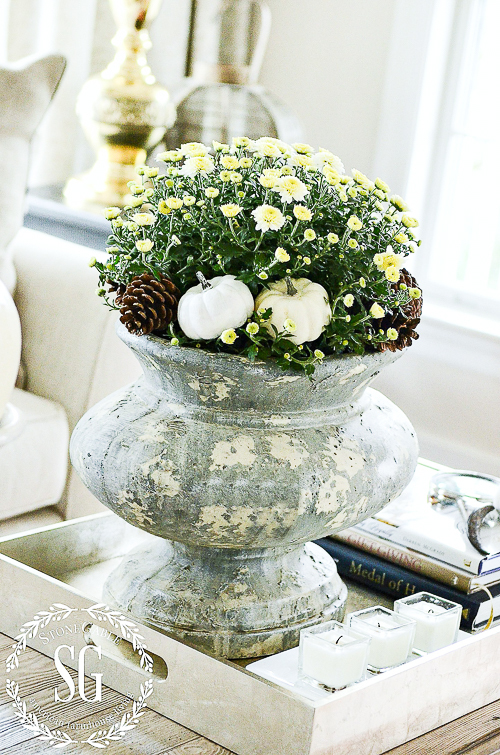 Put the pot or bowl that hold the container into a basket or tray to create a fun vignette. Baskets and trays add lots of interest and tons of texture. 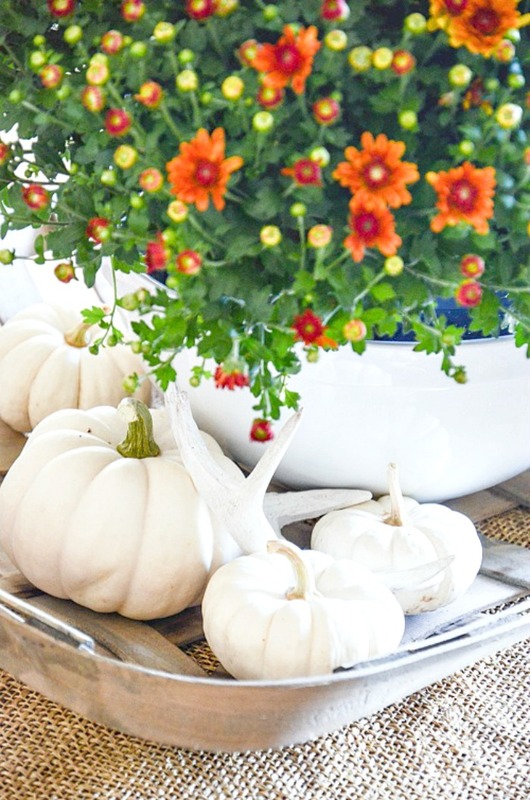 Add a few fall elements like apples or little pumpkins to the tray. Again so so easy-peasy! This will change the entire look of your mums! 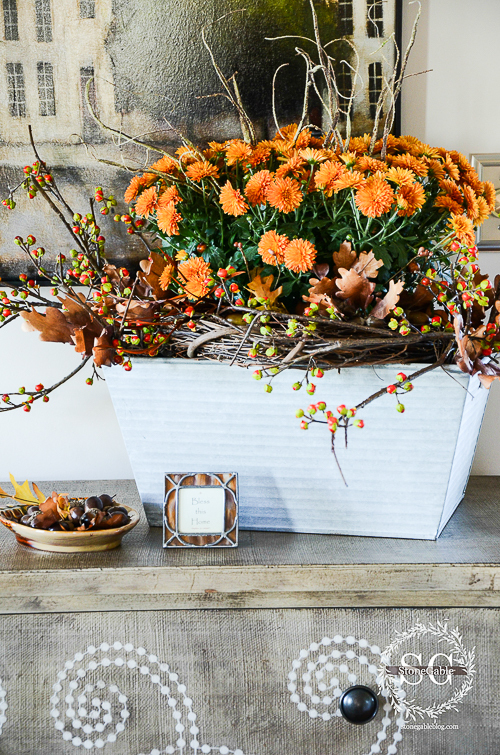 They go from “nice mums” to “fabulous fall vignette”. I used a tobacco basket to corral my mums and mini baby boo pumpkins! I put these soft white mums in a big heavy urn and then put the urn in a more formal gold tray. Don’t they look so pretty? Much better than if they stood alone! If you have a gap between a container and the bottom of the blooms and the black mum container shows, use a grapevine wreath to bridge the gap and give your mums a brambly look! Wreaths are wonderful to fill in the gaps! If mums plants are a little small for a container I add more fall sticks and twigs and pine cones and pumpkins and gourds, and bittersweet and leaves and any other sort of fallish thing I can find! A little bit of embellishment makes a huge difference! This petite pot of mums were put in a chamber pot. 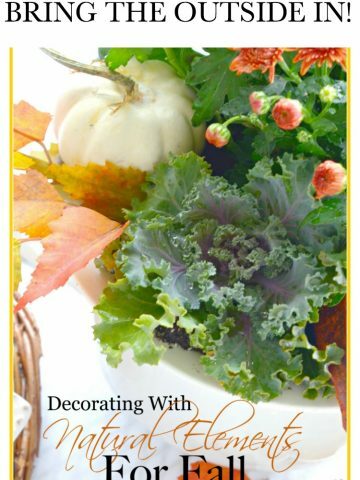 I added an ornamental cabbage and other fall “fluff”. 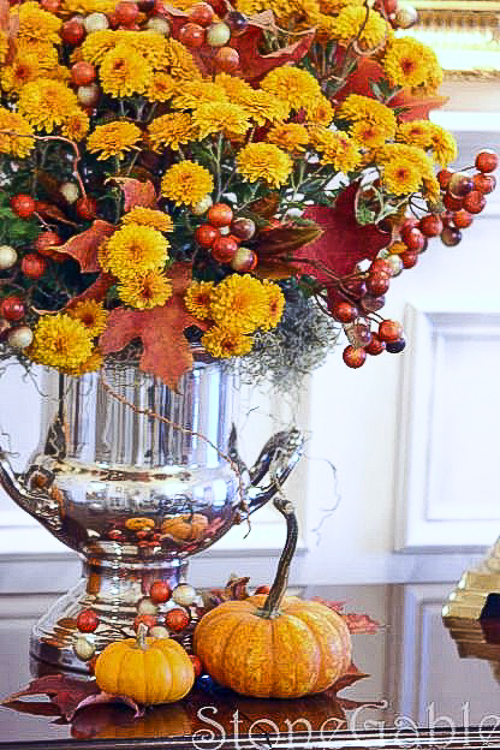 It became the centerpiece for al fall inspired table. A duo of mums were popped into galvanised metal container and put in a galvanised tray. 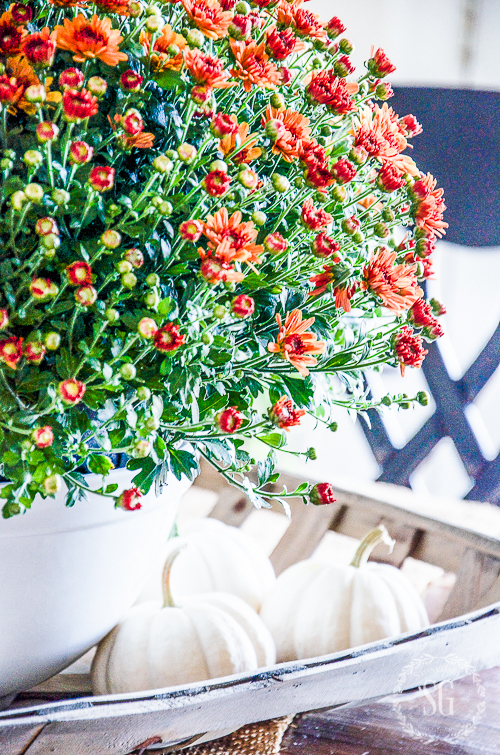 I embellished the mums with asparagus fern and bittersweet… and lots of little pumpkins! This olive bucket has white mums peeking over its top. 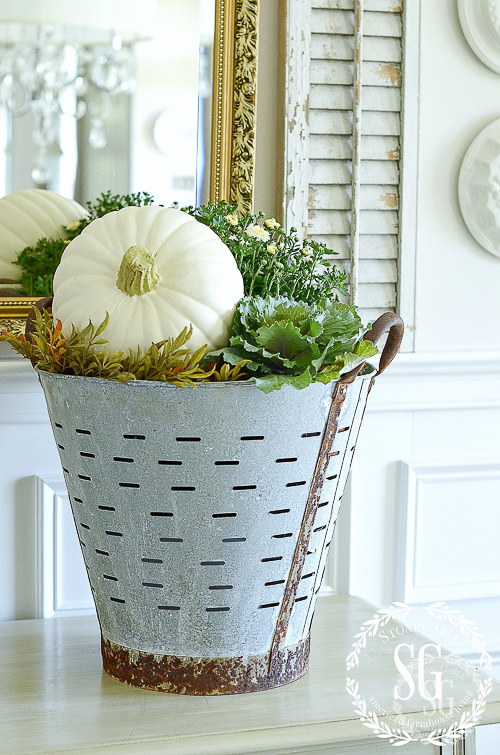 It’s just one of the fall embellishments of odds and ends in the bucket! Why spend lots of $$$ for fall cut flowers when you can buy a couple big pots of mums for under $6.00 and create a gorgeous big arrangement of cut flowers! And if you change the water often, mums last a long long time! I tucked a few berries in this arrangement! I hope this makes you look at mums in a whole new and different way! 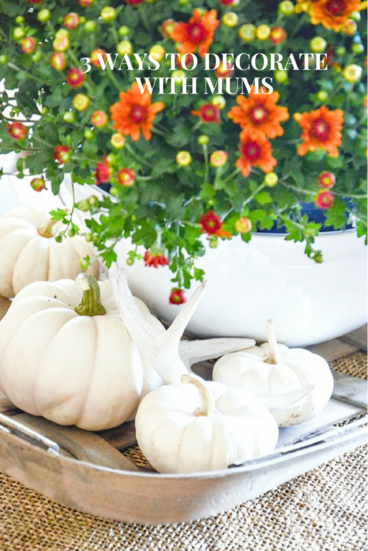 This fall decorate with mums! What a great question! I’m not sure. Google that! You never disappoint! Great ideas on a budget is what I need! Thanks! 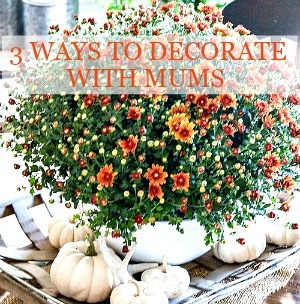 Ilove each one of these ideas, decorating with mums. You nailed it! I just love the way you style mums. I take inspiration from your postings. Happy Fall! 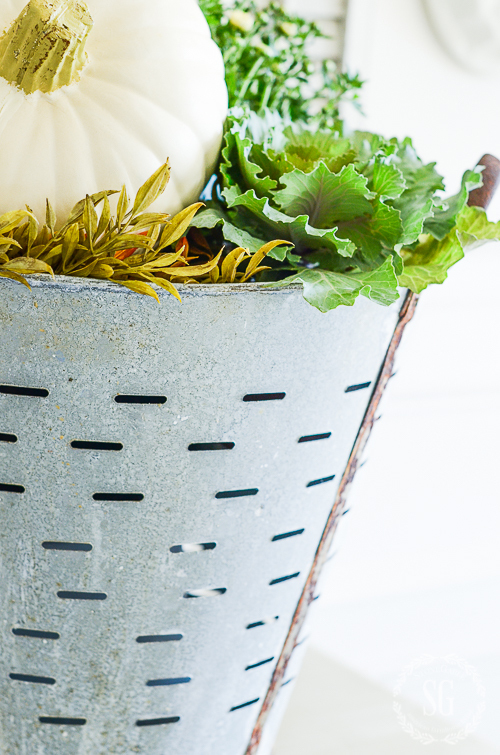 I tried recreating your olive bucket with the white mums and located it on my butcher block in the kitchen. Brilliant! It’s so soft and yet pops that area. Thank you for all the pumpkin ideas. i wanted a way to use some of the baby boo pumpkins we grew and this article inspired me! 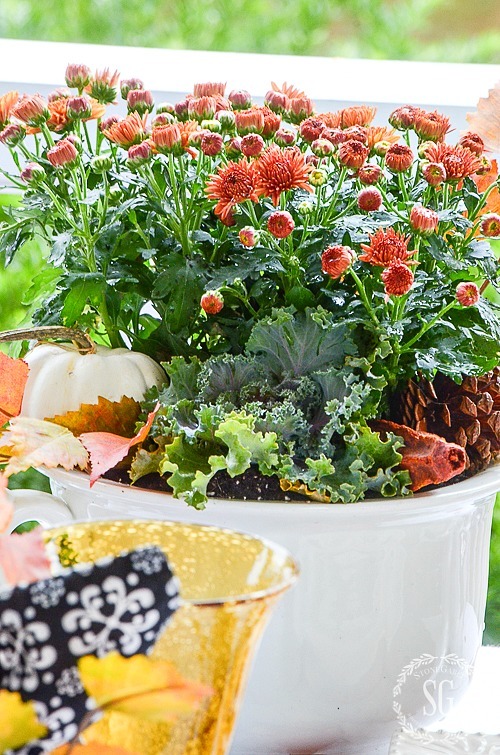 I have gotten many compliments on the tray I filled with a potted mum and pumpkins. Wait until you see what a cute project I have planned for them this week! You’ve got me thinking now about how to dress up my mums! I need to buy some mini pumpkins and tin pails! So very pretty. You just inspired me to go to our favorite plant store in town, Molbaks, and get some mums. 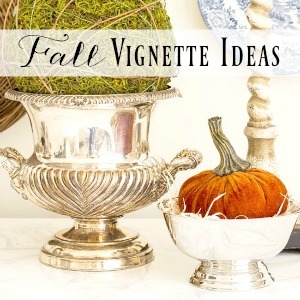 I have several champagne silver buckets and want to copy your beautiful ideas! I love the colors of mums and their fragrance also! I am a LEO and Leos love earthy colors! 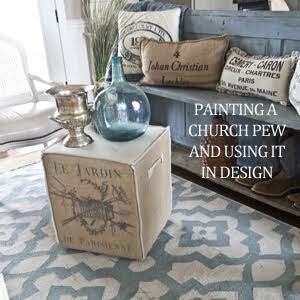 Would like to find some additional white containers…am always on the lookout at our church thrift store. Your photography is always beautiful. Flowers are so lifelike, that I feel I could almost pick them. Never thought of embellishing my mums – but I will now! And the wreath underneath them is exactly what the small mum on my front porch needs – I even have an extra grapevine wreath in the garage – easy peasy!! Thanks for the tips – have a very blessed weekend! I love the idea of mums inside!! Had never even thought about bringing them inside. Beautiful!! I just love hydrangeas but because of the Texas heat they’re near impossible to have here. However, mums we can do and I just love em! As far as using them in the house do you find lighting to be a problem or do they do ok? 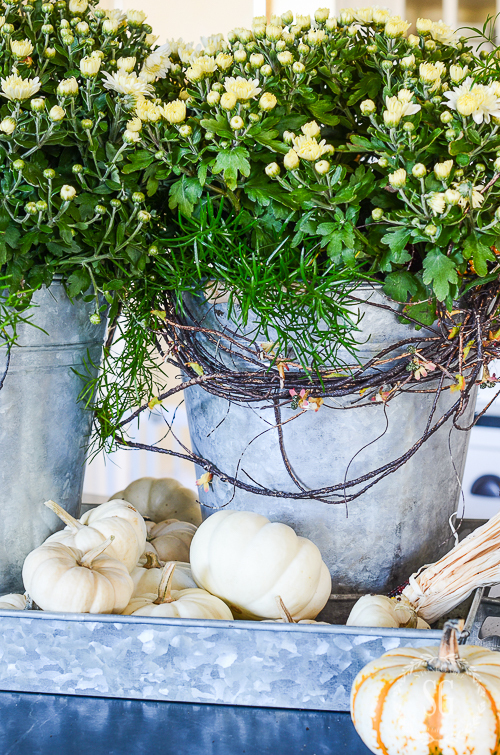 I love those apricotty colored mums in your ironstone sitting in your tobacco basket. I haven’t gone yet to get any. I want to put them off a little so I will still have some blooms at Thanksgiving. Do you think that is possible. I am not good with flowers. Amazing ideas always…I will be using a lot of them! I always place my mums into other containers but have never embellished them. Well I know what I’m doing today. Thanks for the tip. Gorgeous ideas. I have underestimated mums! Thank you! Love these ideas to dress up mums! I will be getting my mums this weekend! I have been using mums this fall, but I’ve only used them outside. I never thought to use them inside. 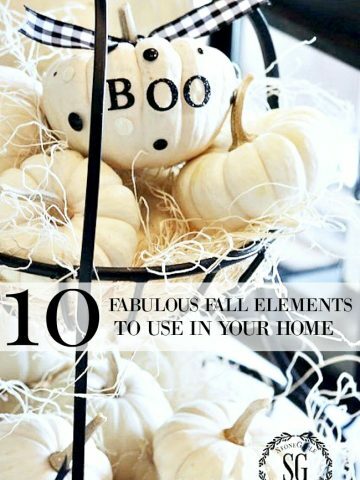 You’ve given so many ideas for embellishing them indoors or outside. Thanks so much. Ann on Sutton Place encountered her followers to check out your blog. I’m so delighted that I did. Thank you for your fall inspirations. They’re magnificent and festive. Gets me in the mod to celebrate fall! So glad you are here, Mary! Each of your pictures was prettier than the next. I never thought about embellishing mums, but everything you did made such a difference. I may never be satisfied with a plain mum again! Usually mums are a “must have” for my fall decorating, I have yet to purchase one mum this year. What is up with that? Never take for granted your ability to hop in the car to get what your mind envisions. I’ve wanted to get mums for months but it isn’t going to be I guess. I too think they are fun to await their opening!!! I had some in my rather long window box and my very helpful gardener planted them all in a straight row under my eaves in a bare spot of my flower bed. They are growing! Maybe this year I shall have my mums for free!!! Your orange were an exceptional color breed this year!! 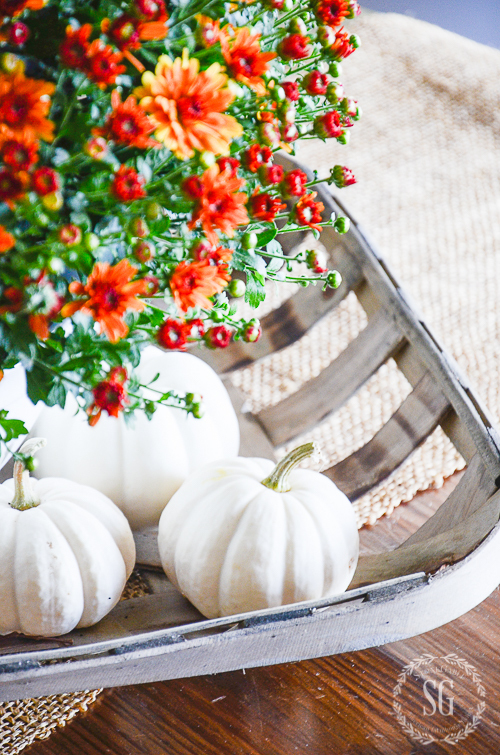 All your mums and pumpkins look so prettGreat tips and ideas for Fall! 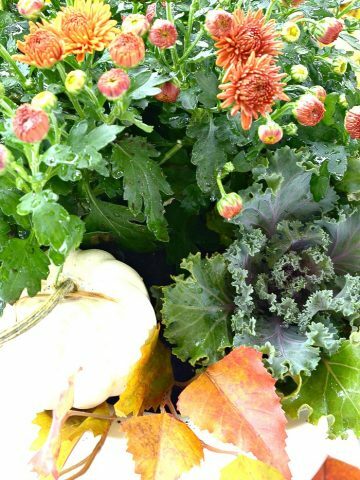 Along comes fall…and here comes the mums…just seems right…thanks for sharing our creativity. You are truly blessed! Yvonne…..you’ve inspired me to get out and get some Mums! They certainly add cheer to every space. Thanks for your blog….I always enjoy it! I never thought mums would do well inside. I will try this! I think of them as long lasting cut flowers! The smell of mums has always reminded me of funerals, but your decorating ideas have inspired me. Maybe this year I will like mums! Beautiful! I love fall mums but tend to buy too early and the hot Kentucky sunshine bakes them!! I now have two, one in a very large olive basket and the other one sitting in an old chair with a hole cut out for containers. It’s in an apple basket! Looks really cute! These are both on my front porch. Along with pumpkins and a scarecrow! Next time I go to the store, I will buy a couple for inside!! Loved the mum ideas. One question, where did you find the tobacco tray. I grew up and still live on a tobacco farm in central NC. I would love to purchase one. Thank you so much for the beautiful ideas! The mums are beautiful and so are the containers!!!! My favorite is the olive bucket!!! You inspire me!I will not be afraid to use my everyday treasures with the beauty and bounty of fall! You have the talent to make even the lowly mum look wonderful. I love mums! Great ideas, as always! I just love mums – they’re beautiful! I love your ideas to add some berries and leaves in there, tucking them in and putting in beautiful containers. 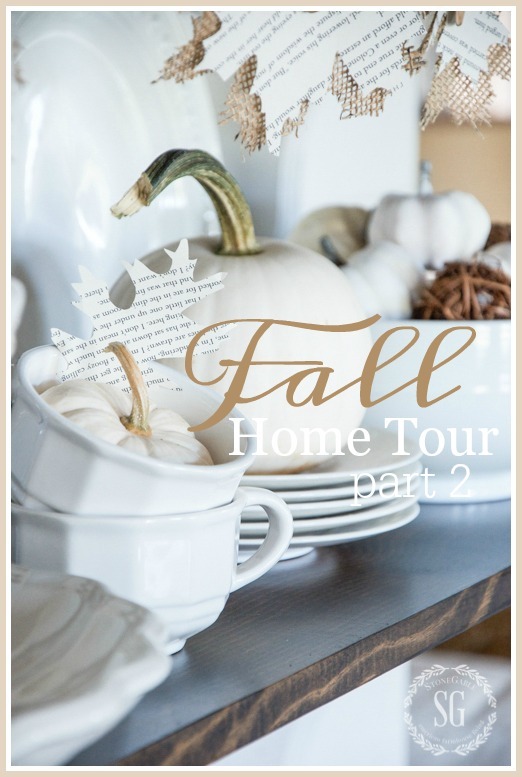 So wonderful for Fall! Yvonne, I love mums and pansies this time of year. Thank you for all the contain ideas, grape vine and metal containers. I am going to buy at least my mums and a few pumpkins this weekend. The humble mum…elevated! Thank you for such lovely ideas. Every day! Yvonne, your arrangements do bring the lowly mum up 100 notches! Your posts always inspire me. Your mum arrangements are beautiful. I love mums too. Thanks for the tips to enhance their beauty! You know how to embellish mums. 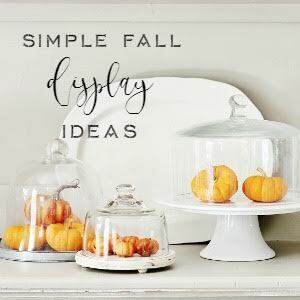 What great ideas to add natural fall blings. Beautiful mum ideas and brunch setting. 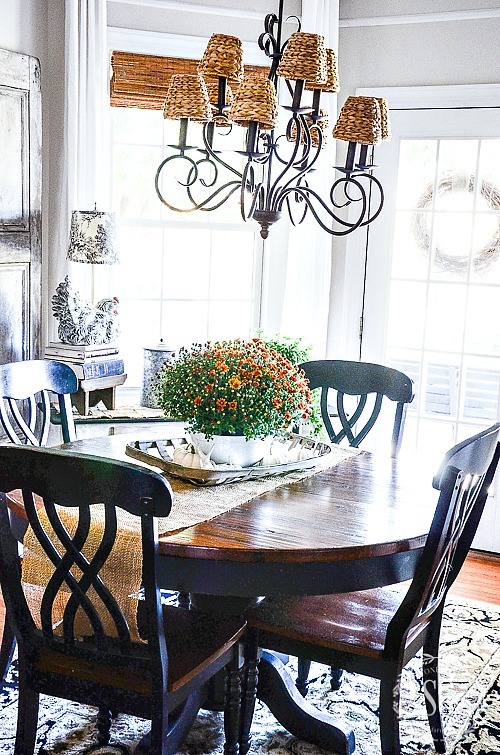 I have always admired the table lamp in your breakfast room and wonder if you can share where it was purchased? Lovely Yvonne! I love mums too. Their smell just reminds me of Fall. Thanks Yvonne! I love the idea of putting moms in a container and surrounding them with a wreath and etc. Also, buying a pot of mums just for cut flowers. How fun! I have never had much success with them outdoors. Never thought to bring them inside before because of the children, but may one day! I always put mums on my front porch. I love the fall flowers and they are so hardy. Your ideas are wonderful for fillers and they look great. Thanks. Just found your blog and I love it! You have inspired me. I look forward to what you do next. Thanks enjoy the day!! Hi Linda, Welcome to the StoneGable family! Hi Linda! Welcome to the StoneGable family! I too love mums! I bought two of the most beautiful ones and have used them in my front porch decor. I love all of your beautiful ideas for indoor use too. 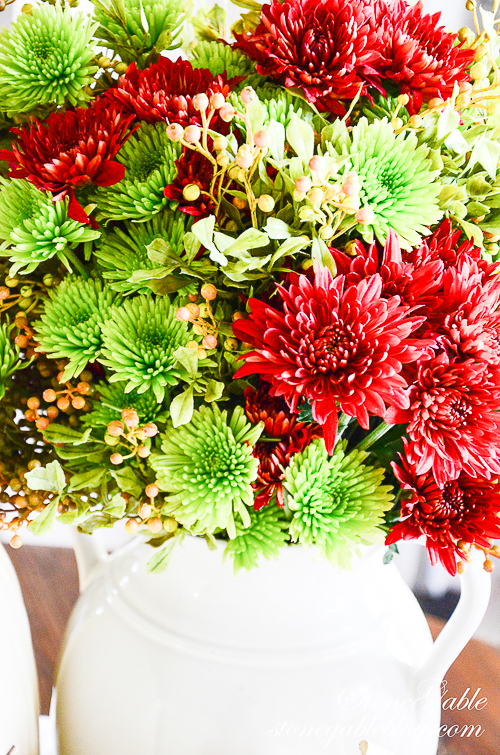 Love your embellishments.Mums are my favorite and beautiful flowers but your addition of berries and grapevine wreaths really add character and interest. Love starting my day with Stone Gable. Thanks for all the wonderful ideas. Just beautiful, your pictures are gorgeous. Thank you for sharing. Beautiful Yvonne! I love all the different ideas and containers that you put the mums in! 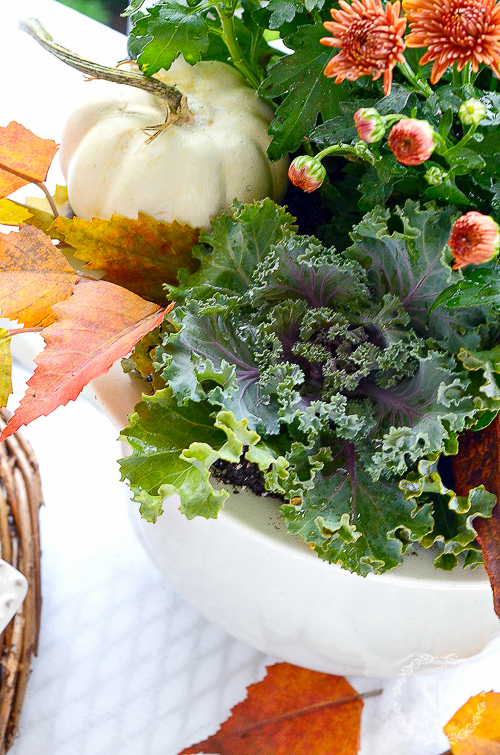 So pretty and with all the textures of berries, pumpkins, baskets, etc. love it! Thanks for the ideas! Love your ideas as always Yvonne, beautiful! What incredible ideas you have shown us using mums! I love them all…now I have to decide which one(s) I want to try first!!! Decisions, decisions…. Thank you, Yvonne, for such awesome eye candy! 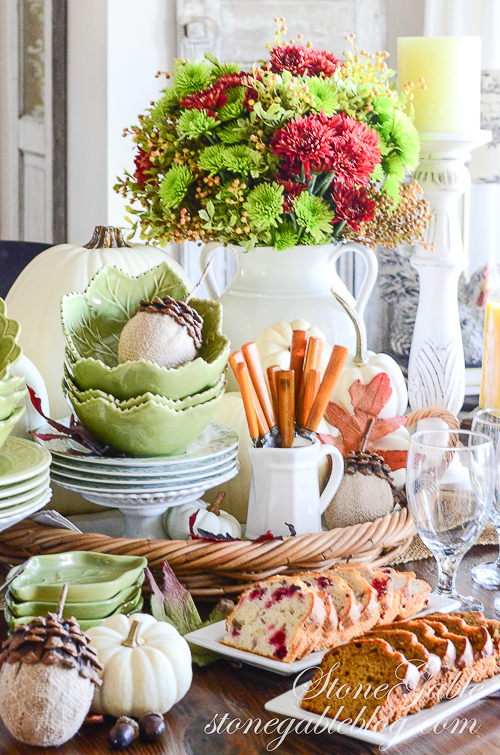 Love the idea with the grapevine wreath! Thanks for all the ideas! You always have the BEST tips and info. Love your blog and love you!!! Don’t forget to water the plants that are inside in their pots, just do not overwater. 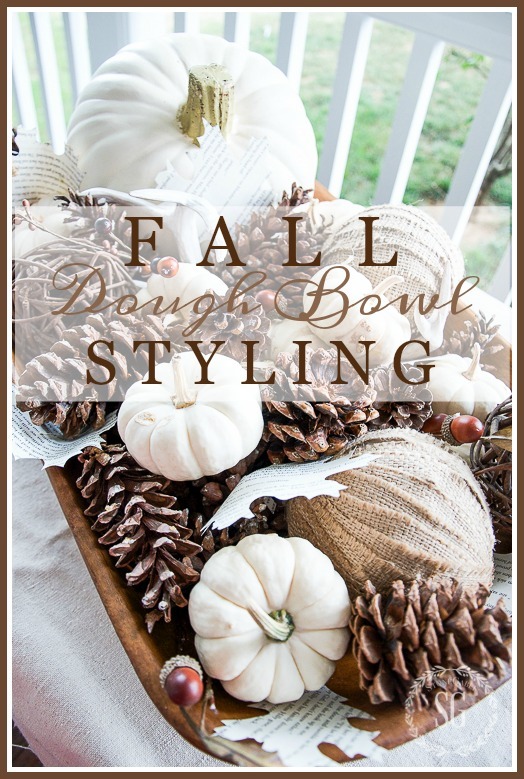 Great styling and great tips! What a fabulous idea of cutting them and putting them in a container instead of buying flowers! It seems so obvious, yet I never would think to do that. You are so right – for $6.00 or so, you could have a beautiful arrangement! I love mums! The best thing is that they are perennials, so when you are finished enjoying them inside, plant them outside and enjoy them year after year! I have always felt the same way as you about mums. However, your arrangements have me headed for my favorite greenhouse. Oh, my! I love your posts, Yvonne. You are stretching my mind in new directions. Thank you for the inspiration. Thank you for the inspiration and beautiful ideas. I love way you’ve displayed your mums! I was trying to figure out what to do with the mums I’m going to put on the front steps. The buckets are a great idea!! I usually use faux flowers inside because of my cats, who love to eat anything green or plant-like and always get sick afterwards! But I always put mums with a collection of pumpkins (got a ton in Lancaster County this week) and struggle with those ugly plastic pots! Thanks for the ideas. I’m off to buy mums this week. It’s time to bring the summer cushions in and get ready for coziness. Beautiful arrangements. What a genius idea to use the tobacco basket in the arrangement! You’ve inspired me to pull my tobacco basket out and also use it in a similar way! I love when StoneGable inspires! Stunning arrangements! Thanks for all of your ideas. Love all the beautiful ideas!